I just discovered beautiful Light Spring Kerry Bishe. Black totally overwhelms her, as it does all Light Springs. She needs delicate, warm color. So pretty! Gentle colors allow the subtle gradations of Light Spring skin to appear in their full complexity. Kate Bosworth's lip color here isn't echoed in her skin. Light Spring's pinks don't get this bluish. This is actually very close to one of the colors that distinguish Light Summer from Light Spring. OMG, so good. The lip is more peachy, as it should be, and belongs on her face. The glossy finish is something that's especially nice on Light Springs because the delicate feeling of gloss echoes the delicacy of their colors. Elizabeth Banks, like many Light Springs, is naturally a brunette but totally believable as a blonde. The only thing I'd change in this pic is the lip. Light Spring doesn't go this bright. Lovely Elizabeth is upstaged by her own lips. Much better, right? We see the whole woman. In a way, wearing one's best colors requires a certain bravery - the courage to be truly seen. This lippie is too cool. No lip color should read as purple on the face, even if it looks purple in the tube. On the right face, purple will just look natural. This lippie is too warm. Again, no lip color should read as orange, no matter how orange it is in the tube. On the right face, the orange lippie will just blend harmoniously. Context! Now... this is what I'm talking about. That's a nice, gentle, peachy lip for Renee Zellweger's gentle, peachy complexion. This lighting is not true-to-life; you can tell because her hair and skin appear weirdly pale and light. Even in the wrong light, though, the right colors should still look harmonious. It's clear here that the makeup isn't helping; the violet lip in particular makes her look zombieish. These are lovely, natural, neutral-warm Light Spring colors that come straight from the season's palette. Amanda Seyfried looks finished but harmonious, not overly made up. Yikes! Scarlett Johannson is scary in these too-warm, too-bright colors. What a relief. Here, she's irresistable in the delicate Light Spring colors meant for her. Where is she? Light Spring Paris Hilton disappears in this harsh look. Just lovely. This Light Spring look is sweet, innocent and (perhaps ironically) perfect for her. 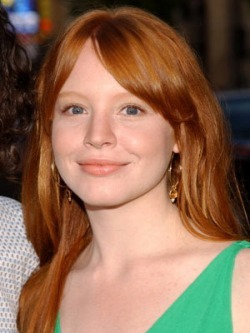 Poor Lauren Ambrose. Some stylists can't see past the red hair; they assume she's an Autumn and dress her accordingly. Her delicate coloring is completely lost. The glorious effect of the light blue-green gown and subtle makeup reveal her as the radiant Light Spring she truly is.